**UPDATE** Contest is now closed. Happy Monday! So last week I posted my review of the Corioliss Classic Pro Flat Iron, in case you missed it you can check it out here. 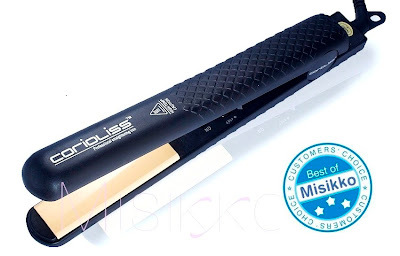 The great people over at Misikko have sponsored this exciting giveaway and one lucky reader will win their very own Corioliss Classic Pro 1" Flat Iron currently retailed at $89.99. **To increase your chances of winning, Misikko has provided a few additional options for entering. 2. Blog about the giveaway on a personal website. That's it! The contest officially begins today Monday, August 23rd 2010 and will end on Monday, September 6th 2010 at 11:59pm EST. That's two full weeks for a chance to win! We will choose the winner at random and make an announcement on the following Tuesday, September 7th 2010. Contest is open to U.S. & Canadian residents ONLY. I am a fan of Gimme That Glow and Misikko on Facebook! i WANT/NEED this Corioliss Classic Pro flat iron! My name is Brooke (@brookeashleyb) at ba.boudreaux@gmail.com. I entered by following Gimme That Glow and @misikko on twitter. Enter me!!! I love giveaways!!!! I follow Gimme That Glow and Misikko on Facebook and Twitter. I have used nothing but a CHI iron! I would love to try this! I subscribe by email and Facebook. Enter me! I love giveaways. Nice site btw. I follow GTG and Misikko on Twitter! I follow GTG through GFC as Jessie Lynn! I already subscribe by email, follow by GFC, follow on Twitter & follow on Facebook. I also follow Missiko on Twitter. I follow Missiko on Facebook. Also, I just realized that in my 3 previous entries I misspelled Misikko. Oops! Sorry. I follow gimmethatglow through twitter & facebook. I also follow Misikko through Facebook.